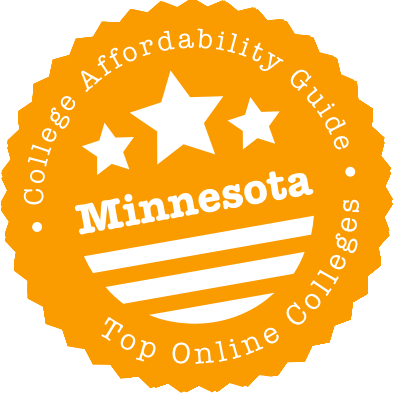 Scroll down to see the top not-for-profit colleges and universities in Minnesota offering online degree programs. The online coursework at Concordia University St. Paul is designed to be experiential and relevant, allowing students to apply concepts they learn in class to real world settings. Online students can earn a degree at any level from associate to doctoral. The bachelor's programs are designed for busy adult learners who already have college credits and just need to take courses in the major. Classes are delivered in asynchronous, seven-week sessions. Many of the master's programs are for educators or business professionals, but Concordia also has master's degrees in creative writing, exercise science, and sport management available online. The online Doctor of Education in Educational Leadership uses a cohort format with a weekly live online chat required. Metropolitan State University offers fully online bachelor's degrees, master's degrees and graduate certificates. Online bachelor's programs are available in business administration, finance, human resource management, individualized studies, industrial management, law enforcement, management, marketing and organizational administration. Online master's programs are available in public and nonprofit administration, management information systems and business administration. Online graduate certificates are available in database administration; healthcare information technology management; information assurance; management information systems; and wound, ostomy, continence (WOC). Additionally, individual online courses are available in subjects such as ethnic studies, human services, math, nursing, psychology, social work and statistics. Although most online courses have no face-to-face requirements, some require proctored exams at an approved testing center. As a member of the Minnesota State Colleges and Universities, Metropolitan State University also offers its students access to Minnesota Online, which includes a catalog of over 6,500 online courses and 245 online programs. Online students at MSU are offered student resources, such as virtual library services, writing center support and math center support. The College of St. Scholastica offers bachelor's, master's, and doctoral degrees in business and technology, health sciences, nursing, and education through programs that are entirely or mostly online. Business degrees available online include a B.A. or B.S. in Computer Information Systems with a concentration in health care, management, software engineering, or web development. The college also offers online B.A. degrees in accounting, management, and organizational behavior as well as an MBA in rural health care, IT leadership, business leadership, finance, or health care leadership. Students interested in education can complete their Bachelor of Science in Elementary Education in a blended format that combines online sessions with traditional classes. The Master of Education program is available completely online. The School of Health Sciences offers online programs leading to a B.S. or M.S. in Health Information Management or an M.S. in Health Informatics or in HIM/IT Leadership. RNs can pursue a bachelor's degree or Doctor of Nursing Practice through online programs, while students with a non-nursing B.S. can qualify as nurses through a hybrid program. Online students are assigned a personal adviser and can access the same counseling, tutoring, and advising services that are offered to on-campus students. Minnesota State Community and Technical College has online programs in about 30 fields, and in some of the subjects, students can earn anything from a certificate to an associate degree. About half of Minnesota State students select the university transfer degree, and academic advisers are available to help students select courses that align with their career interests and help create a seamless transfer. Students seeking a career in health care can get training in pharmacy technology, medical administration, or medical coding. Techies can study web design, computer programming, or network security. There are also several choices related to business, including accounting, supervisory leadership, and entrepreneurship. Overall, the college offers more than 300 classes online. Of all the sections for all the classes offered at North Hennepin Community College, 22 percent are delivered online, and another 15 percent have a hybrid or blended format. With that much online availability, students can earn about one dozen different degrees online, including two of the three most popular degrees North Hennepin awards: Associate of Arts in Liberal Arts and Associate of Science in Business Administration. The rest of the degrees and certificates offered through online classwork fall into the categories of accounting, business, and computers. The college has both transfer and career associate degrees in those fields, along with about two dozen certificate programs. Anoka-Ramsey Community College boasts that it offers the most online credit courses of any two-year school in the Minnesota system. Additionally, the college has four associate degree programs and two certificates that students can complete entirely through online coursework. The available online associate degrees are all designed for students who want to complete the first two years of a bachelor's degree before transferring to a four-year college. Students seeking career skills can earn a certificate in business computer applications or in general business. Online courses follow the semester calendar used on campus. Enrolled students can use an online diagnostic tool called SmarterMeasure to determine if online classes are right for them. Lake Superior College offers more than 200 courses online each semester and has more than a dozen degree programs that can be completed entirely online. Most of the online degree programs are technical degrees for students who want to gain or increase their job skills. Students interested in business, for instance, can earn an associate degree in business administration or accounting. Those interested in gaining computer skills and certifications can pursue programs such as CCNA, computer science, or network administration. The Associate of Science in Fire Science and Administration is a transfer degree. The college also has online programs for students who want to work as a dialysis technician or paralegal. Minnesota State University-Mankato offers online programs at the undergraduate and graduate level. Online bachelor's degree completion programs are available in applied organizational studies, international business, technical communication, urban studies, dental hygiene and nursing. Online master's degrees are available in communication studies, educational technology, library media education, reading, forensics, teaching and learning, technical communication and Spanish for the professions. Additionally, online undergraduate certificates are available in two subjects and online graduate certificates are available in 14 subjects, including coaching education, ethnic studies, aging studies, nonprofit leadership, professional communication, autism disorders spectrum, culturally responsive teaching and technical communication. Individual online courses are offered in subjects such as art, chemistry, corrections, dental hygiene, electric engineering, English, ethnic studies, family consumer science, geography, geology, gerontology, history, human performance, humanities, mass media, music, psychology, special education and statistics. Most online programs are offered entirely remotely, although some programs have limited in-person or on-campus components. The master's program in reading, for example, requires the completion of a practicum in a student's local community. The online baccalaureate programs offered at Bemidji State University are degree completion programs that require applicants to have the equivalent of at least two years of college prior to admission. The following degrees are offered entirely online: Bachelor of Science (BS) in Accounting, BS in Business Administration, Bachelor of Applied Science (BAS) in Applied Engineering, BAS in Applied Management, BS in Criminal Justice, BS in Marketing Communication, and BS in Psychology. A Bachelor of Arts in Psychology degree is also available completely online. Required and elective courses for the RN to BSN and the Bachelor in Social Work degrees are offered mostly online. The university also offers online programs on the graduate level. At the current time, the following degrees are available: Master of Business Administration (MBA), Master of Teaching (MAT) - Online Instruction, and Master in special Education (MSpEd). Bemidji's online MBA program is comprised of 30 credits (10 courses) and can be completed in just one year. Courses are six to eight weeks long and available entirely over the Internet. Online MBA students are eligible for in-state tuition rates. Non-degree licensure and certificate programs are offered online in a number of areas including special education, health, and online teaching. The Department of Business at the University of Minnesota Crookston offers Bachelor of Science in Accounting (BSA) students the chance to enroll in online CPA review courses that can also be credited towards the BSA degree. These courses are offered in conjunction with Gleim CPA Review. Students can take up to a total of 12 credits under this option. Additional BS degrees are available online in a number of other fields such as applied studies, communication, finance, international business, and sport and recreation management. The BS in Applied Studies degree is a highly individualized program that allows students to customize their educational experience by enrolling in select courses that support their career goals. Online certificates are available the fields of finance, sport and recreation management, taxation, and manufacturing management. Both full-time and part-time online students may be eligible for an annual scholarship of $500 from the university. To be considered for this funding opportunity, students must be enrolled in a degree program (not just a certificate program). In addition, the Berland Grant provides tuition, fees, and book allotment for one class for qualified non-traditional students (including online enrollees) who are returning to college after a five-year break from their post-secondary studies. Saint Mary's University of Minnesota offers fully online programs leading to degrees in fields such as nursing, business, and education. The nursing degree is a degree-completion program that is open to registered nurses with an associate degree or diploma in nursing. The RN-to-BSN program is delivered in an accelerated format that allows students to finish the degree in a year. The online MBA program is also an accelerated program that allows students to select an area of emphasis in data analytics, social media management and marketing, or sustainability and environmental management. Students may enter the 30-credit MBA program in the fall, spring, or summer semester and finish the work in about 18 months. Other online programs that St. Mary's offers include a Master of Science (M.S.) in Accountancy, M.S. in Project Management, Master of Arts (M.A.) in Health and Human Services Administration, M.A. in Human Resource Management, M.A. in International Development, and M.A. in Organizational Leadership. Educators can earn an M.A. in Educational Leadership, M.A. in Special Education, or Master of Education in Learning Design and Technology. Students enrolled in any online degree program at Saint Mary's receive an iPad with the university's mobile learning platform already installed. Minnesota West Community and Technical College has more than 40 programs that can be completed online, ranging from short-term certificates to associate degrees that prepare students for a career or to transfer to a four-year school. Many programs focus on business subjects like accounting and management. Health care programs range from an associate degree in nursing to a medical coding diploma. More than a dozen online programs cover some aspect of computers, from web design to cyber security. There are also several very specialized programs, such as biofuels technology. Minnesota West has been named one of the top 150 community colleges in the nation three times by the Aspen Prize for Community College Excellence. Inver Hills Community College has four degrees that can be completed online. The Associate of Arts is a general transfer degree that allows students to complete the Minnesota Transfer Curriculum and take additional courses so they can transfer to a four-year school as a junior. The transfer curriculum is accepted at all Minnesota state universities. The other online degrees are an Associate in Science in Contemporary Business or International Business, which are designed as transfer degrees, and an Associate of Applied Science in Contemporary Business Practice, for people who are in the workforce now or who want to start work immediately. IHCC is active in Quality Matters, a peer review process that certifies the quality of online courses. Northland Community and Technical College offers online programs in four broad areas. In some of these areas, such as manufacturing, the options are career oriented and may be fairly short term programs leading to certificates. At the other end of the spectrum, the liberal arts and science area is where students who want to earn a four-year degree can finish their first two years of school. Students complete the Minnesota Transfer Curriculum, take lower-level classes in their intended major, and are ready to transfer as a junior after receiving their associate degree. Between pure career and pure transfer, the business and health and human services areas have online program options for both kinds of students. Alexandria Technical and Community College offers 10 online programs in fields as diverse as computer information systems and legal administration. Students who expect to transfer to a four-year school to complete a bachelor's degree can earn an associate degree in the business transfer pathway curriculum or an Associate in Science in Individualized Studies, which allows them to focus on career interests that aren't covered by a structured degree program at the college. Speech-language pathology, legal administration, and human services practitioner are some of the Associate in Applied Science degrees available online. Online diploma programs include medical coding. Northwest Technical College has online programs in three broad areas: business, health and human services, and science and technology. Within each of these areas, the college offers certificates, diplomas, and degree programs. These credentials are "stackable," with credits from a certificate, for example, also applying to a diploma. Students can begin simply by completing a certificate in a semester or two to gain skills. Many of the associate degree programs transfer directly to Bemidji State University and other colleges. Northwest is a partner in Distance Minnesota, a consortium of five schools that collaborate to provide online classes. The university offers two online associate degrees - Associate of Arts (AA) and Associate of Science (AS) - and two online bachelor degrees - Bachelor of Elective Studies (BES) and RN to BSN. There are eight online master's programs available: Applied Behavior Analysis (M.S. ), Criminal Justice (M.S. ), Technology Integration (M.S. ), Library Media (M.S. ), Instructional Design and Training, (M.S. ), Public Safety Executive Leadership (M.S. ), Regulatory Affairs and Services (M.S.) and Teaching English as a Second Language (M.A.). In addition, the university offers seven graduate certificate programs: Addictions, Design for E-Learning, Community Education Director, Technology Integration, Instruction Technology, Library Media Specialist and Traffic Safety Education. Online learning takes place through Blackboard, the learning management system that is used for classroom instruction and interaction. Minnesota State University Moorhead has four bachelor's degree programs available in an online format. Graduate students can earn online master's degrees and graduate certificates in fields including business, education, nursing, and health care. Undergrads can enter the online program to earn a Bachelor Science degree in business administration, operations management, or project management. Working nurses with an associate degree or diploma can complete work for their Bachelor of Science in Nursing. A majority of MSUM's graduate programs have online options. These include an MBA, which is also available with a health care management concentration, Master of Health Care Administration, and Master of Science in Nursing with an emphasis in nurse education or nurse administration and organizational systems leadership. Educators can enroll in a variety of online programs to advance their career, including master's, education specialist, and doctoral programs, along with a variety of certificate and licensure programs. Programs offered include degrees in educational leadership or curriculum and instruction, and licensure in special education and school principal. The Digital Campus of the University of Minnesota has over 1,422 online courses offered in its four campuses. The University of Minnesota Twin Cities offers 19 undergraduate programs and nine master's programs that can be pursued completely online. There are four master's programs and eight graduate and undergraduate certificate programs that can be pursued partly online. The Doctor of Nursing Practice degree is an online hybrid program with 14 areas of specialization. The University has two degree completion programs - Bachelor of Science in Applied Studies and Bachelor of Arts or Bachelor of Science in Multidisciplinary Studies. Fully one-third of all the academic credits earned by students at Riverland Community College come from online classes. About 20 programs can be completed entirely through online coursework, including the Associate of Arts degree that is designed for students who plan to transfer to a four-year school. The AA meets the Minnesota Transfer Curriculum requirements and includes electives students can use to get a jump start on their intended major. Many online programs are designed for students who want to take new skills directly to a job, and they can get degrees, diplomas, or certificates in fields such as accounting and web development. Central Lakes College ramped up its distance learning portfolio in 2017, making the Healthcare Administrative Specialist associate degree available online, with the exception of one course. During the fall and spring semesters, enrollees can choose between a dozen or so offerings from nearly as many disciplines, such as math, Spanish and philosophy. All of them fall within the Associate of Arts curriculum, with the courses designed to transfer to four-year colleges in Minnesota. Crown College offers a range of associate, bachelor's and master's degree for online students. Students with no college background can earn an Associate of Science in Business, Associate of Science in Christian Ministry, or an Associate of Arts in General Studies. All the online bachelor's programs lead to a Bachelor of Science degree. Degrees offered include alcohol and drug counseling, biblical studies, business, Christian ministry, criminal justice, disaster and emergency management, general/liberal studies, global and cultural studies, and psychology/counseling. The online MBA program has a concentration in nonprofit management. Students earning the Master of Arts in Christian Studies, Master of Divinity, or Master of Arts in Ministry Leadership can choose an emphasis in disaster and emergency management, executive leadership, intercultural ministries, pastoral counseling, pastoral leadership, social science research, spiritual formation, or theological studies. The Master of Arts in Global Leadership has concentrations in church development, community development, disaster management, international Christian education, and nonprofit leadership. Crown also offers a Master of Arts in Counseling and Master of Arts in Organizational Leadership to online students. Bethel University offers 32 online programs, including graduate degrees, certificates, and adult undergraduate programs. It also has an online seminary program. Most of the programs focus on the fields of education, business, nursing, or ministry. Some of the programs, including many of the degrees offered through the online seminary, require students to attend a one- to two-week residency in Saint Paul, Minnesota. Adult undergrads may be able to earn credit towards their degree for prior experiences. Bethel may grant credit for professional credentials and military experience, and it accepts prior learning portfolios and standardized test scores for credit. Undergrad programs offered online include bachelor's degrees in business management, Christian ministries, management information systems, and organizational leadership, as well as associate degrees and an RN to BSN program. Graduate programs include an online MBA and master's programs in strategic leadership, nurse educator, or nurse-midwifery. Educators can earn Master of Arts in Education, Ed.D. in Leadership, and a variety of licenses for teachers and education leaders. The online seminary offers masters' degrees in children's and family ministry, Christian thought, theological studies, divinity, transformational leadership, and ministry. Hamline University has a variety of online programs that can be completed fully or almost fully online. The low-residency online Master in Public Administration delivers classwork online, with members of the cohort attending weekend residencies every two months at Hamline's facility near Minneapolis. The residencies come at the beginning and end of each eight-week module. Students can complete the MPA program in two years. Cohorts enter the program each spring. The Master in the Study of Law program is completely online and features a focus on conflict resolution. The program is not approved for paralegal training, nor does it qualify graduates to practice law. Credits earned in this program are not transferrable to a J.D. program. The rest of Hamline's online programs are offered by the School of Education. All the coursework for these programs is offered online, although some programs require a practicum. Degrees offered include Master of Arts in Education, Master of Arts in Education: Natural Science and Environmental Education, Master of Arts in Literacy Education, and Master of Arts in TESOL. Hamline also has online programs for teachers seeking add-on licensure and certificates. The College of Education, Leadership, and Counseling at St. Thomas University offers a Master of Arts (MA) in Special Education degree that includes synchronous and asynchronous components. Courses are delivered in eight-week formats and there are six sessions each year. The college also offers special education Minnesota license options in the following areas: autism spectrum disorder, academic behavioral strategist, developmental disabilities, early childhood special education, emotional behavioral disorders, and learning disabilities. Course assignments and requirements that need to be completed in a school or community setting can be done in a student's home community. Merit scholarships and need-based grants are available to both online and on-campus students enrolled in degree programs at the college. St. Thomas University has a Doctorate in Social Work (DSW) degree available online. The program consists of 45-credits (15 courses) and can be completed within three years. The DSW program follows a cohort model of education and includes a two-week, on-campus residency every summer. The university's Opus College of Business offers a Master of Business Administration (MBA) program that follows a hybrid system of delivery. A Health Care MBA degree and a Master of Science in Health Care Communication program are also offered online. Winona State University offers a Bachelor of Applied Science (BAS) degree in healthcare leadership and administration that can be pursued entirely online. This is a degree completion program designed specifically for students who already hold an Associate of Arts, Associate of Science, or Associate of Applied Science degree in the healthcare field. The BAS program follows a cohort model of education and allows students to choose either a two-year or three-year plan of study. Students accepted to the program adhere to an interdisciplinary curriculum and enroll in courses from the following disciplines: business administration & management, communication studies, educational leadership, healthcare leadership & administration, nursing, and statistics. On the graduate level, Winona State University offers a distance option for students pursuing a Master of Science degree or certificate program in the field of nurse educator or in nursing and organizational leadership. The distance option is a three-year plan that allows students to take all the required courses for their program in a hybrid format. The Leadership Education and the Counselor Education programs at the university also offer several required courses online. Martin Luther College has an online program focused solely on graduate degrees for educators. Classes are offered in an asynchronous format to allow teachers to fit coursework into their busy schedules. The Master of Science in Education program allows students to select a focus in leadership, instruction, special education, or educational technology. Candidates in the program may also earn post-baccalaureate licensure. Students may be able to complete the program in as little as two years, spread it out over as many or seven years, and possibly just take classes in the summer. Martin Luther College's Master of Science in Educational Administration has two tracks: early childhood director or principal. The degree requires 36 credits, and teachers preparing to become either a principal or an early childhood director must work a six-credit internship as part of the program. All applicants to Martin Luther College's graduate education programs are expected to have an undergraduate GPA of at least 3.0, although students with a lower GPA may be accepted on a probationary basis. GRE or GMAT scores are not required. Online learning in Minnesota is dominated by two acronyms: UMN and MnSCU. These state giants have come up with all kinds of ways to help distance learners save money. At each public college or university, there are tuition breaks, transfer agreements, special scholarships, military benefits, and more. In our quick guide to choosing an online program in Minnesota, you’ll find details on a number of their initiatives, plus some important advice on regional accreditation. Not sure if you’re ready for an online degree? The Minnesota Office of Higher Education (OHE) has a section on Strategies to Evaluate Online Education. Here you can find an extensive list of links to Minnesota Colleges Offering Online Courses. However, the links go straight to the college website—you’ll have to do some digging to find the actual programs. OHE also provides advice on questions to ask about an online program of study and a Distance Learning Calculator to help you calculate your online savings. The website for Minnesota State Colleges & Universities (MnSCU) has a ton of useful info for students applying to one of the 30 community and technical colleges or 7 state universities in the MnSCU system. Visit the Online Learning section to search for MnSCU online degrees or credit courses or try the free online career workshop to create your education goals. Each entry in the Colleges & Universities search (under the “Academics” tab) will also have a list of online programs/majors that the school offers. Through Smarthinking, MnSCU schools make 15 hours of online tutoring available to all students. The University of Minnesota (UMN) Online has a comprehensive catalog of online degrees & certificates offered by UMN System schools (Twin Cities, Duluth, Crookston, Morris, and Rochester.) Each degree entry has details on important points like tuition rates, GPA requirements, total credits, and more. In the separate section on General Information, you’ll find advice on enrolling, transferring credits, and applying for financial aid. Just want to take a class? UMN Online has a separate catalog of online courses, which includes credit courses, professional development options, and free MOOCs through Coursera. What’s more, UMN’s Post-Secondary Enrollment Option (PSEO) gives high school juniors and seniors the opportunity to take online courses at a UMN school. Another useful resource to know about is Distance Minnesota. This is an online higher education consortium with four members: Alexandria Technical and Community College, Northland Community and Technical College, Northwest Technical College, and Bemidji State University. You can use the site to find online programs or individual online courses, including Minnesota Transfer courses, offered by these four schools. Since these programs are also covered by the MnSCU website, you may want to start there first. Nevertheless, Distance Minnesota’s Students section still has plenty of useful advice for prospective online students, transfer students, and the military. Trying to earn online college credits while you’re in high school? The site’s Online College in the High School will guide you through the process. 5. What is the Minnesota Transfer Curriculum? All two-and four-year public colleges and universities, including MnSCU and UMN schools, participate in the Minnesota Transfer Curriculum (MnTC). The MnTC is intended to help students easily transfer their course credits in general education from one school to another. In the MnTC, students must earn a minimum of 40 credits in 10 goal areas (e.g. communication, natural sciences, math, etc.). Each institution gets to plan its MnTC package. Students who successfully complete the MnTC package can receive credit for all lower-division general education requirements when they’re admitted to another institution. If students don’t complete the entire MnTC package, universities (e.g. UMN) may evaluate MnTC credits on a course-by-course basis. You can use the Minnesota Transfer website to find links to colleges that have MnTC programs. Trying to get career re-training? The Workforce Innovation and Opportunity Act (WIOA) is a federal program designed to support underemployed or unemployed citizens. It helps out with tuition & fees for approved educational programs (i.e. career training programs). A number of MnSCU and UMN’s online programs have received WIOA certification. MnSCU has an entire section devoted to WIOA programs on its CAREERWise website. The MnSCU academic program search will also tell you whether a degree program is WIOA-certified. UMN has a list of online & hybrid WIOA-approved programs in the General Information section of UMN Online. If you find a WIOA degree program that you like, contact your nearest Minnesota Workforce Center to tell them about it and request WIOA support. Thinking about an out-of-state online program? We wanted to point out that Minnesota is part of the Midwestern Higher Education Compact (MHEC), which runs a reduced tuition student exchange program called the Midwest Student Exchange Program (MSEP). Minnesota students enrolling as non-residents in certain programs at MSEP campuses may be eligible for a tuition discount. These Minnesota schools have the honor of appearing on both our “Top Online” and “Most Affordable” lists. That means they met some very tough criteria for quality, flexibility, price, and use of financial aid money. (You’ll see a CAG Score next to their profiles in our ranking.) Once you’ve put together a shortlist, College Scorecard has useful financial statistics about each institution, including the percentage of students paying down debt within three years of graduation. ATCC’s online programs are listed under its Programs and Majors Overview. Each program page breaks down the coursework and typical semester schedule. Online tuition rates are the same, regardless of residency, but individual courses may have different tuition rates. ATCC Foundation Scholarships are available. If you’re planning to move online credits from an associate’s degree into another school, be sure to visit the Transfer section. ATCC is a partner of Distance Minnesota, which has a lot of info & advice on earning an online degree at a community college. Details on BSU’s online degree programs can be found on its the Extended Learning website. There are degree completion programs for bachelor’s students and master’s degrees & certificates for graduate students. Minnesota residents and out-of-state students pay the same tuition rate, and distance learners are eligible for a variety of specific scholarships. BSU is a partner of Distance Minnesota, and it has a special More with 4 program designed to help you transfer previous college credits. If you’re planning on earning an inexpensive online associate’s degree at a community college, it’s worth knowing that BSU has a special guaranteed admissions agreement with Northland Community and Technical College called NorthernConnect. CLC’s Academic Program Listings can be sorted by campus (look for “Online”). CLC also offers selected college courses through its Live Online delivery system and non-credit continuing education online courses (e.g. accounting, grant writing, etc.). Are you still in high school? You can earn CLC college credits ahead of time via distance learning. The Business Office deals with tuition & fees; online students pay a little extra per credit vs. campus students. Since CLC is a community college, most CLC programs are AA or AAS degrees that you can apply to a bachelor’s program. CLC has a special arrangement with the Minnesota State College and University system to make credit transfers smooth & easy. MSU’s Center for Online Learning is a good place to start. It has a list of MSU’s fully online programs and descriptions of online courses. It’s also part of Minnesota Online, which lists more than 6,500 courses and 245 online programs offered by Minnesota State institutions. Tuition & fees are handled by the Office of Financial Management; residents and non-residents pay the same online tuition rates. You can search for scholarships by subject area and degree level. One thing to note—almost all out-of-state students can take an MSU online program, but residents of California, Florida and Massachusetts are not covered by the NC-SARA agreement. MSU Mankato’s Online Education website has the latest on its online degrees & certificates, including details about bachelor degree completion programs. For tuition & fees and advice on financial aid, visit the Campus Hub section of the university’s website. MSU Mankato participates in the MSEP program & reciprocity agreements, which means online undergraduates in nearby states get a tuition break, and scholarships are available for non-traditional students (e.g. adult learners). If you’re coming from another school, the university has some guidelines for student who wish to transfer credits. MSU Moorhead has a full catalog of Online Undergraduate & Graduate Programs on its website. Undergraduate online tuition rates and graduate online tuition rates are listed separately. Minnesota residents and students in neighboring states (i.e. states covered by reciprocity agreements) get a substantial discount! Non-residents pay a good deal more. You can search for scholarships by program, major or area of interest. Minnesota West Online will give you the scoop on online degrees & certificates. It also offers single online courses for students who want a hybrid education. Tuition rates for online programs are slightly higher than on-campus programs, but Minnesota West has special reciprocity agreements (i.e. tuition discounts) with South Dakota, North Dakota and Wisconsin. And specific scholarships are available to online students! Thinking of transferring your online credits to a bachelor’s degree? The Transfer Services staff can help answer questions. Minnesota West has a number of articulation agreements with public and private universities in both Minnesota and South Dakota. Northland’s Online Learning website has the skinny on its online programs, as well as some helpful advice on becoming an online student. High school students in select partner high schools (Online CHS) can take online courses for college credit. Tuition rates for distance education classes are fixed, regardless of residency status, but they’re reasonable. Credit transfers to a Minnesota state college or university are very straightforward: the Minnesota transfer curriculum is built into the Associate of Arts (AA) degree and Northland has a special guaranteed admissions arrangement with Bemidji State University (BSU) called NorthernConnect. Like BSU, Northland is a partner of Distance Minnesota, which has some useful advice on earning an online degree at a community college. UMC’s website on Online Programs has a complete list of its career-focused online degrees, courses & certificates, as well as info on tuition & fees (online students pay the same rate, regardless of residency) and financial aid options for distance learners. Online students are eligible for grants & scholarships such as UMC’s Online Scholarship and internship & research opportunities. UMC also offers a free pre-evaluation for online students who wish to transfer credits. And that ain’t all! UMC has linked up with the University of North Dakota (UND) to offer an online MBA, with courses charged at an in-state tuition rate regardless of residency. It also has a working plan with the U.S. Air Force ROTC program at UND in Grand Forks. Students complete ROTC requirements, tackle UMC’s online BS in Applied Studies, and become commissioned as an officer in the Air Force. UMT doesn’t have an online section on its website, but you can find degrees and certificates through UMN Online. Like Duluth, UMT’s One Stop Student Services has the lowdown on tuition & fees and financial aid. UMT is the host campus for the College of Continuing Education (CCE), which has plenty of online UMN credit courses & certificate programs for working adults, including online Grad School test prep. CCE students are billed at UMN tuition rates, and there are no restrictions on financial aid for term-based courses. WSU Online doesn’t have a special section for its fully online programs (you can find those on the MnSCU website), but it does allow you to search for any online course in WSU, including non-credit & continuing education courses. Each catalog listing has a section on course tuition rates; the Admissions section also lists tuition & fees (students in certain nearby states pay in-state tuition rates). WSU accepts a number of Prior Learning Assessment (PLA) credits from adult students, such as credit for military training, and various tutoring services are available to distance learners. Always check that your school is fully accredited by an organization recognized by the U.S. Department of Education. National accreditation may apply to distance learning institutions (including for-profits), but regional accreditation is the gold standard—especially if you’re trying to transfer credits or apply for federal financial aid. The Higher Learning Commission (HLC), formerly known as the North Central Association of Colleges and Schools, is the regional accrediting body for Minnesota community colleges & universities. Use the Directory of HLC Institutions to search for HLC-accredited institutions by state. In the Status area, HLC will list whether a school has recently been placed on Probation. Considering an online degree in another state? It’s easy to check any institution’s regional or national accreditation status using the Council for Higher Education Accreditation (CHEA) Database. This database covers the whole country. Fortunately, Minnesota doesn’t have as many problems with diploma mills as some other states (like California). But here are a couple of schools with accreditation or quality concerns. UMS is an unaccredited school that does not appear in the CHEA Database or College Scorecard. It states it has accreditation from the American Association of Drugless Practitioners (AADP) and the American Alternative Medical Association (AAMA), but neither of these bodies are recognized by the U.S. Department of Education. University of Phoenix is a for-profit university based in Arizona. It is regionally accredited by the Higher Learning Commission (HLC). However, College Scorecard reports that the Saint Louis Park Campus has an extremely low graduation rate and a lower than average number of students paying down their debt within three years of leaving school. University of Phoenix has also been the subject of multiple lawsuits over the years. Higher Learning Commission (HLC): HLC provides regional accreditation to universities and community colleges in Minnesota. (It used to be called the North Central Association of Colleges and Schools, which you may sometimes see on websites). Use the Directory of HLC Institutions to search for HLC-accredited institutions by state. CAREERwise Education: Run by MnSCU, this website provides career advice and college planning tools. You can also use it to find online and on-campus WIOA-certified programs. Minnesota Online Quality Initiative (MOQI): MOQI provides cost-effective opportunities for faculty from the Colleges and Universities of Minnesota State and the University of Minnesota to participate in Quality Matters (QM) workshops and courses. That means these schools have made a serious commitment to improving online learning. Minnesota Transfer: This site has everything you need to know about transferring credits to and from Minnesota schools, including details on the Minnesota Transfer Curriculum (MnTC) and links to colleges that have MnTC programs. Strategies to Evaluate Online Education: Minnesota’s Office of Higher Education (OHE) has some helpful advice about choosing an online program at a Minnesota school. Distance Minnesota: Find online programs or individual online courses offered by Alexandria Technical and Community College, Northland Community and Technical College, Northwest Technical College, and Bemidji State University. Minnesota State Colleges & Universities (MnSCU) Online Programs & Courses: Search for online programs or online credit courses in schools that belong to the MnSCU system. UMN Online Degrees & Certificates: Find online programs at any one of the five campuses in the University of Minnesota (UMN) System. UMN Online also has a separate catalog for online courses.